Day 173: Oh, So Close . . .
Wow! It’s a Wednesday but feels like a Friday! We know that it’s NOT Friday, but — holy cow — it sure FEELS like a Friday!!! Between early morning meetings and late afternoon/evening meetings, we’ve been going in so many directions, it’s hard to keep pace!! In our part of the world, today, the rains teased us with a few downpours that seemed to offer hope to end this long drought for our community, and it was followed by partly cloudy skies and warming temperatures this afternoon. At the rate we are going, who knows what tomorrow will bring. But, regardless of the weather, here we are in the 20th day of February . . . and – ok, we’re sorry, but what in the heck happened to January? Or more importantly, who absconded with the first month of the year? The last time we looked in, it was two or three days into the New Year! Now, we’re 45 days into the the year and with today being Day 173 . . . we are edging ever so close to the mid-point of our journey through SO MANY wines! 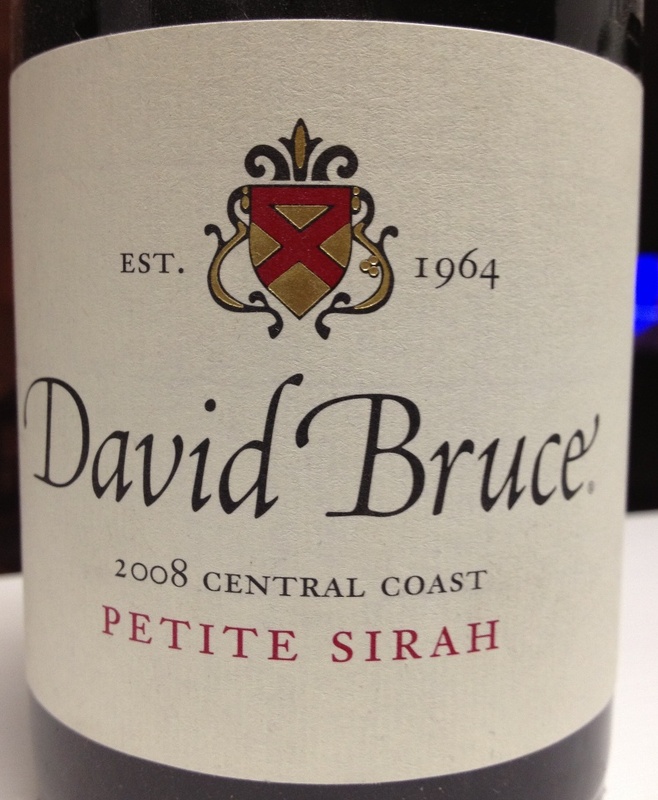 Tonight we sampled a 2008 David Bruce Petite Sirah from the Central Coast of California. A couple of thoughts before we talk about the wine itself. . .first of all, the Central Coast is FAMOUS for beautiful Sirah and Petite Sirah wines. Secondly, this wine maker, has a history of producing exceptional wines from a variety of vineyards for remarkable products. So, back to the wine – it is an interesting wine in that it depends on and relies upon Mother Nature to ripen fruit relatively close to the ocean while at the same time being part of the growing area in the Central Coast . . . in the simplest terms the fruit is harvested from areas. – – – “Stretching in a narrow band from Santa Barbara to the San Francisco Bay,the Central Coast region, and is characterized by the cooling influences of the Pacific Ocean.These grapes come from several vineyards in Paso Robles and southern Monterey”. After tasting this wine and appreciating the enormity of the Petite Sirah, we found that the fruit was really forward on the palate – we’re talking blackberry and blueberry. The nose, well, it was dominated by oak and tobacco – toasty and smoky (but not overly so). The finish on this wine is LONG and lean . . . yep, it’s got a lot of body, a lot of taste and a lot of structure. It’s a wine that you’d break out when your ‘wine-loving friends showed up on a Friday night’ (or on a Wednesday night after a long day) . . . yep, it’s a wine meant to be enjoyed by customers and FUTURE customers! Seriously, thank goodness that we’re almost to Friday. Before you get there, you’ll need to try this beautiful and affordable Petite Sirah . . . at less (key word: LESS) than $20 a bottle, you’ll be singing the praises of this David Bruce Petite Sirah whether by yourself or with family and friends. . .beyond that, it’s a GREAT bottle of wine! Regardless, continue to enjoy your favorite wine responsibly, and remember to recycle whenever possible! Categories: Uncategorized | Tags: 2008 David Bruce Petite Sirah, Central Coast, Petite Sirah, red wine, Wednesday night | Permalink.